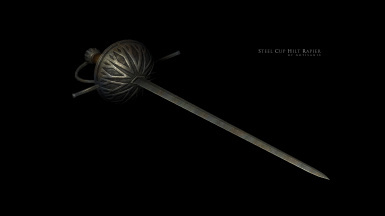 This mod adds two steel rapiers to the game (one with swept hilt, another with cup hilt). 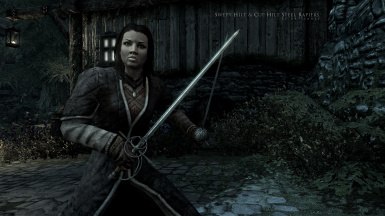 This mod adds two steel rapiers to the game (one with swept hilt, another with cup hilt). 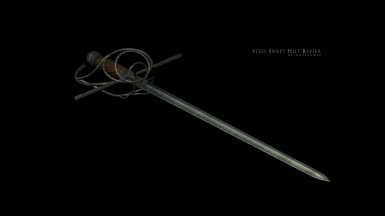 Weapons are similar to the steel sword (slightly lower damage but faster and lighter). Can be crafted (steel category) and tempered (bonus from steel smithing perk). (default path from Steam's main folder is: Steam\SteamApps\common\skyrim\Data). » In Skyrim Launcher choose "Data Files" and make sure that checkbox near the .esp file is selected. » Start the game and load your any save then play. then the chest should open from where you can transfer the rapiers to your avatar's pockets. » Such thing as removal of this mod does not exist, but if you must then delete the same files you copied previously during the installation proccess. This mod adds only the new stuff. It doesn't overwrite or change anything from the original game thus incompatibility with other mods has been reduced to minimum.